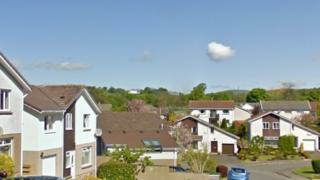 An 80-year-old woman has been robbed by five masked men in her home in Dunfermline, Fife. The gang forced their way into the house in the town's Gowkhall area before stealing jewellery and a gold Rolex watch. The robbery took place at about midnight on Thursday. The men escaped before the pensioner was able to call the police. Officers have urged anyone with information to come forward. Det Insp Graham Fenton said: "This has been an absolutely terrifying ordeal for the elderly homeowner who is deeply upset and is being supported by our officers. "I believe the local Gowkhall community will be outraged by what has happened here and I would urge local residents who remember seeing anything suspicious to contact us immediately. "In addition, anyone with any further information relating to this incident should also get in touch."